You might think, from my lack of posts, that I haven’t been working on much over the last few weeks. I ha ve, but unfortunately I’ve been working more on work than on any crafts. I’ve done a bit of knitting, even more ripping out (oh, how I hate backwards progress), and some sewing, but no actual finishing for a while. I’m posting today because the Apron Queen tagged me a couple of weeks ago and one of the options was to do a Vintage Thingies Thursday post. It’s taken me a while to get to it because the vintage thingy I had planned to write about requires ironing and—alas, it’s the story of my life—I could not find time to iron and take pictures and write. 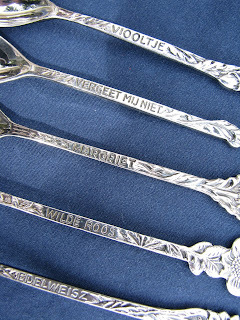 They’re about 4 inches long and each handle has the name of spoon’s flower written in what I assume is Dutch. 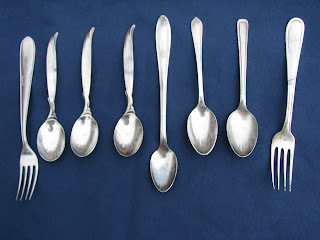 There are also several assorted spoons and forks. The longest is about 6 inches. 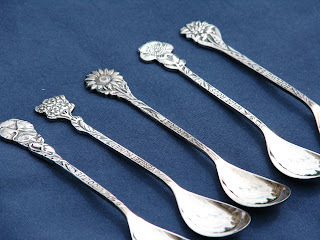 I’m guessing that the other fork might have been for something like pickles and that the spoons were for coffee or tea. There weren’t that many babies in the family. 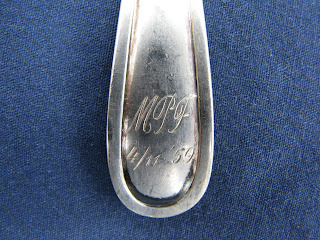 The three matching spoons (and two others not pictured here because they have a mysterious red substance stuck to them and need cleaning up) are stamped on the back with the year (1947), the manufacturer (Rogers Bros.) and the pattern name (Flair). I’m not sure what I’ll do with them all. Maybe I’ll start having tea parties! *If you are reading this, intended recipient, I will give it to you the next time I see you. I was going to send it to you along with your favorite meatloaf recipe and a message saying "Put a fork in it!" but I didn't want to trust it to the mail. These spoons are awesome. Makes me feel guilty for using platic forks or Wal-Mart forks! :D My husband travel often & he always brings our girls back one of those little souvenir spoons. Thanks for sharing. It was worth the wait! BTW, I HATE ironing too. How nice to have such family treasures in your possession. I know you will enjoy using them and sharing them with others. These are really beautiful! 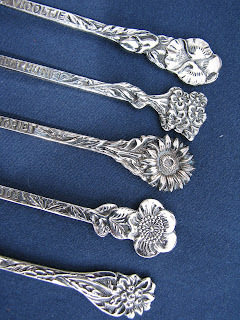 My mother collected silverware too . I have never seen anything like these though - a real treasure! As always, love the cartooney pictures you find. They really crack me up. Spoons!!! My mother has lots that have been in the family for along time. Though she hates to clean them, she has them hanging on a spoon rack in the dining room. They're soooooo cool. So bravo on your post, and how cool your mom gave them to you. I need to let my mom know I like them, so I get them when the time comes instead of one of my brothers. Note to self. You mentioned Ironing.....perhaps someday, you can explain to me what that chore is. lol HATE it with a passion.